Today I found out how to test a car alternator. Step 4: There are two ways to test the voltage coming from the alternator. If you have easy access to the alternator without getting your body parts / clothing / etc tangled in the spinning pulley’s, then place the positive multi-meter probe (red) and touch it to the red terminal connector coming out of the alternator. Now take the negative (black) multi-meter probe and touch it to some metal part of your car frame (like a bolt head nearby or even the negative terminal on the car battery). Don’t ground to the alternator itself. That would be potentially bad. You should now be getting a reading on your multi-meter display. If you don’t have good access to your alternator, then you can simple test the alternator by touching the positive multi-meter probe to the positive terminal on your battery and likewise the negative probe to the negative terminal on your battery. If the alternator is working well, your multi-meter should read somewhere in the vicinity of 14 volts (typically 13.8-14.2). If it is reading excessively higher than 14 volts (greater than 15 volts) it is possible that the voltage regulator on your alternator is faulty or going bad. If it is reading lower than 13-14 volts, there are a number of possibilities as to the reason. First, it is possible that your engine idle speed is too low for the alternator to put out sufficient voltage/power. Try revving up the engine to 2000 RPM or higher and take a reading. If the voltage is still too low, check to be sure all the connectors on your alternator are tight and that the alternator belt is not slipping and is spinning on the pulley correctly. If it is still not putting out sufficient power, then the alternator’s voltage regulator could be bad or the alternator itself may need replaced. A car alternator needs to be putting out at least 13-14 volts (ideally between 13.8 and 14.2 volts) to effectively charge a 12 volt car battery. If the alternator is putting out too much voltage (15+ volts), it is likely your battery acid will boil over out of the battery. When a battery is near fully charged the alternator will cease to put out sufficient voltage to charge the battery and the reading you will get from the battery probing method will simply be the voltage coming from the battery itself. In this case, you can simply leave your lights on with the car off for ten or fifteen minutes to drain your battery a little bit. It can also be helpful to test at the battery terminals with the engine off and then turn the car on and test again at the terminals. If your battery is more or less fully charged, it should read at around 12-13 volts with the car off. 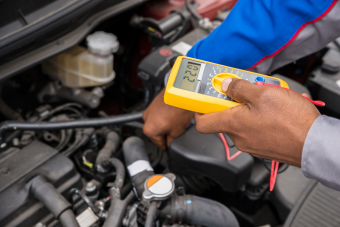 If you’ve run your car for a long time and while the car is running the voltage reading is in the 13-14 volt range, but then you shut the car off and the battery voltage instantly drops to well below 12 volts (10 volts or under; 9 volts or under in freezing weather conditions), it is likely that your battery needs maintenance or replaced. @Corey Davis: Sorry, but with a magnetic screw driver, on any metal part will stick. That test is to be done as follows: With a non magnetic tip screwdriver, or any piece of metal, with the car running, touch the back of the alternator, and there should be magnetism. START THE VEHICLE, WITH THE MOTOR RUNNING PULL THE POSITIVE BATTERY CABLE OFF OF THE BATTERY. IF THE ENGINE STALLS YOU ARE RUNNING ON BATTERY POWER ONLY AND THE ALT. IS NOT CHARGING. The test of removing the battery cable to test the alternator was used for vehicles made before 1976! Do not do this, as it can cause a major electrical system malfunction. just search this on the internet. You can also fry electronic parts of your car like that. Costing more in damage than an electrical tester wound cost. While this may work for you, it never a good Idea to disconnect the battery when the engine is running. The battery (arrests)/ takes care of too much charge from the alternator which may damage the electronics and other elements in the car. Y’all mean the NEGATIVE battery lead. Pulling the positive lead with the car running will win you a Darwin Award. I tested my 2001 Toyota Camry’s alternator by removing the negative lead while was running and while my car died the second I loosened the lead, I had no additional parts die on me. Daven needs more electrical engineering classes because putting the other lead on the alternator housing will not ground it out. The housing is grounded to the engine which is grounded to the frame, therefor no differant than touching the lead to the grounded frame. Also potential energy does not get passed through one lead of the meter to the other. If that was the case you would get shocked if you stuck one lead in the power outlet in your home and touched the other lead. It don’t happen. Other than that good write up!!! unless you have really bad luck and a really screwed up multi-meter and stick it in the hot side, but other than that ….. I think the point about not using the alternator for a ground was more directed at making sure no one chooses an unwise place since most alternators have exposed coils and such (like mine). My battery is reading high 11s but car will not start, replaced alternator six months ago can somebody help with goof advice.turned head lights on and voltage dropped. i have a series 3 landrover that is not charging battery. have tried 2 brand new alternators,still no charge,have replaced every wire 1 by 1 to see if any are faulty and still no charge,,, any ideas ??? First off, it is likely that most people reading this son know if their meter should be set on AC or DC to test their altenator and/or battery (DC). Second, when you try to read the voltage of a battery to see if it is good or bad, you need to read the voltage when the battery is under load, or you won’t get a true reading. This is probably the problem Mat is having. Finally, an altenator can work, but not put out the voltage it should, or needs to, so the “magnetic test” is not at all reliable if you want to know if you have an altenator that is going bad. Thank you. I replaced my 2002 opel astra 1.6 cd classic’s battery in june and as from last month have to jumpstar it everytime i need the car but when turning it of it dont want to start,Can it be the alt not chargin or someth else?Need advise urgently. franklin- I replaced battery in my Jeep. Same starting problems as yours. See if there is good contact between the battery cables and the battery posts. Even if tightened all the way down, you might be able to still pull off one, or both cables from the post(s). 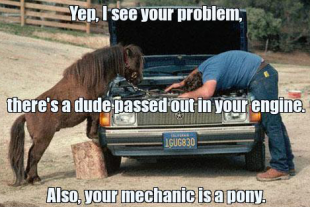 If that is the case, pick up some battery post shims (they are round) from the auto supply store. They slip over the battery posts. Open clamps up so they have a gap and then re-install. A package of two costs about $2.50. Good place to start with your trouble shooting. Unfortunately, I am still working on the rest of the real problem (that’s why I am checking out this site), but the loose terminals are no longer part of it for sure! If you’re unfamiliar with a digital multimeter, I strongly recommend that you look up a couple of multimeter tutorials on youtube. A beginner can easily make the mistake of testing under the wrong setting and end up with erroneous/confusing readings. Or worse, fry their meter. I got a AAA battery one morning my car wasn’t starting because of no power. Technician came out, replaced the battery with a new one, everything was running fine. For the next 11 month. Then one morning, same thing. Car was not starting. No power. Called AAA out again, after checking and have a call with the supervisor, he replaced the battery on warranty again. After 7 month, battery was dead again, but there is no warranty on a replaced battery anymore. So I got a new battery from a local auto part shop and made sure, I have 36 month of warranty. Spend about 400 bucks inside 2 years for batteries. It’s it really the car, kills the batteries or do we have a problem in battery production especially interstate batteries? In the cases where you are losing battery charge, and can’t find any other current drain scourge, it could be a bad starter causing the problem. When I turn to ignition 1/2 way the gauge reads 7 volts. The engine will turn over and start. After started the battery will read 14 volts. Thoughts on this would be appreciated. Some of these comments sound like a trip to disaster why dont you all get a auto electrician to check it with the right equipment. my car battery reading 12.40 when engine stops, reading 11.99 when engine starts, the battery light is not off, but recently sometime Battery light flashing during drive. what is wrong? I have a 1963 buick riviera. The alternator and battery are new and both have been tested. But alternator still isn’t charging the battery. It has an external voltage regulator but I was told that if the regulator was bad it would only charge too HIGH unlike my situation where it isn’t charging at all. True? Good tips for testing the car alternator. I am curious to know if battery needs to be connected after starting the engine and testing the alternator? Would the lights and other electrical parts work with the help of alternator if battery is removed after starting? Okay, so my 2002 Ford Windstar will not start. Thought it was just a bad battery, because we were having to jump start it often. Changed the battery, still won’t start. Was told the starter was bad. Changed the starter, still no start. But, does have a different clicking noise when cranked, than before. I do get power when the key is turned on ignition. All lights, sounds, and dash light up. I am now being told that it could be the alternator. I was told to test it, but am finding no way of doing so, when the vehicle will not start. Please help!!!! There may be a solenoid for the starter and not actually be on the starter. It may be at the side of the engine compartment near the battery box. Or there may be a fuse box with a red power wire of heavy gauge wire going to the starter. This wire needs a tight connection. I suggest using a lock washer. The solenoid has a magnet that energizes when you turn the key to start. Solenoids are a common problem I have found out in many cases. I appreciate you sharing your expertise here on how to test your alternator! My son’s car just had a malfunction, and I definitely think that it needs a new alternator. I had no idea that you were to check the pulley and belt to make sure that everything is spinning correctly! With this information, I think that we are going to be able to find a used alternator that will be perfect for his car. Thanks again! The method outline above for checking the alternator will only check the operation of the voltage regulator. It will not check the current output from the alternator which is what is needed! Battery as it is connected to the alternator it quenches electrical surges during charging.if disconnected it can ruin electronic components and other electrical systems. This test is only pplicable to cars that were were produced long ago. If we remove the battery cable to test alternators, it can cause serious electrical malfunction. You can use google to search more. it is ok? to test the battery output of alternator directly? what is the minimum output of alternator?